Hi! My name is Siobhan and you’re on this page to learn more about who I am. My parents divorced in my teen years and there is a light to starting off with this. I didn’t have a relationship with my dad and that brought a lot of “not being good enough despite exceeding all marks” to work through. Sometimes I still deal with this. My Dad played a tough role and I can’t imagine that choosing this role before he came to earth was an easy one. We learn the most from the “villains” in our life. He taught me this beautifully. He taught me about love. I’ve successfully lived that corporate admin world and learnt how smart I am, but also how I have no boundaries. You give give give and lose yourself in that process. I have always been very spiritual from young. My parents allowed me to follow whatever suited me and this allowed me to have a religious background. As I grew up, I dropped the “religious” label because I struggled to separate myself from others. I wanted to be a part of everything and everyone. After being nothing for a great amount of time, in about 2016, I started my spiritual journey yet again. The catalyst of this journey was my job in which I was unhappy, causing me to start looking for answers to life, myself, whatever. After one “bad” day, I decided to take a trip to the crystal shop which was something I wanted to do for years but I didn’t have the guts. Here is where crystals stole my life and heart, and together we started a journey. One I’m still learning about and will continue to do so for YEARS to come. I attended workshops, read books, attended webinars, made spiritual teacher friends and went on a holistic retreat just because crystals were involved! Some of the workshops I have attended: Meet your Spirit Guide, Angel Communication, Animal Communication and Conscious Channeling. Fast forward to studying: one night housesitting and in my meditation I saw myself working with Labradorite. After researching, I landed in Thea’s lap from ViTerra Healing Academy. I studied under Thea’s guidance and graduated in May 2017. After leaving my “bad” job, I decided that I wouldn’t let anything control me, my emotions or my future. 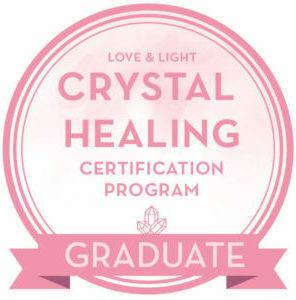 Soon after, I was granted a scholarship to study with The Love and Light School for Crystal Therapy. 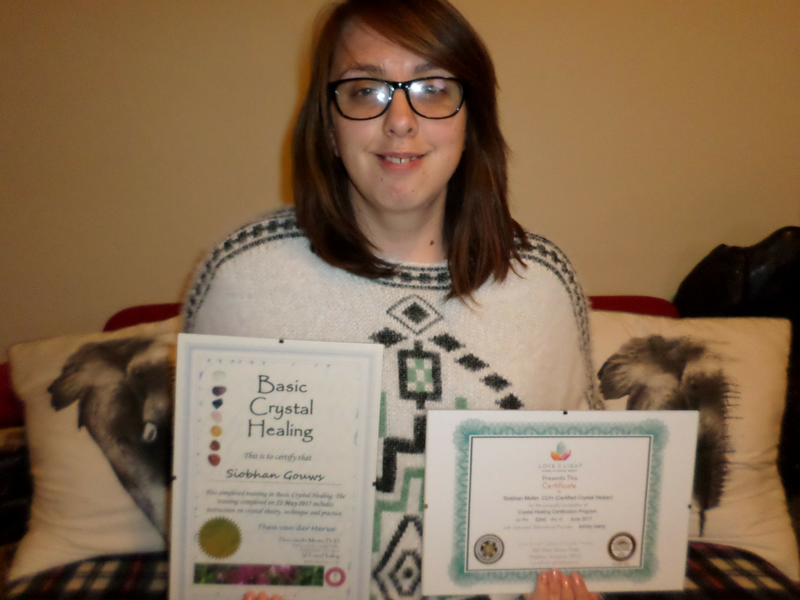 I was amazed that I was chosen for the Certified Crystal Healing Program. In June 2017 I graduated with my classmates, who are now more like camily (crystal family). I studied again with the Love and Light School of Crystal Therapy in August 2017 to study more about Animal Healing. Crystals have helped me calm down, get grounded because Libras have NO idea what grounded is and it’s helped with my anxiety/depression. It’s taught me a lot about myself as well as understanding my weaknesses AND strengths a lot better. I wouldn’t say it’s cured me or made my dis-ease go away, but there is definitely more awareness and clarity. I love crystals and healing because it can help us to connect with ourselves. It has helped me do that and I believe that’s how I work best with Mother Earth’s gifts. Lovingly harassing our pets as well as my husband in my free time. Something you may not know about me is that I also have a Counselling Theory Diploma and I used to be a nail art blogger.